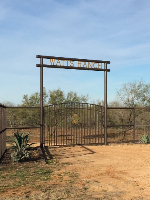 Watts Ranch, family owned and operated, is located near Cotulla, TX in the heart of what has become known as the Golden Triangle. Watts Ranch is your opportunity to access South Texas hunting at its finest. Enjoy many different hunting packages or simply watch dazzling sunsets and relax around the campfire with your family and friends. Get away from it all and savor the experience. We promise you'll come back! Copyrights (c) 2019. All rights reserved. Watts Ranch.